The tolerance for live pests in grain sold off farm is nil. With growers increasing the amount of grain stored on farm, an integrated approach to pest control is crucial. Effective grain hygiene and aeration cooling can overcome 85 per cent of pest problems. When fumigation is needed it must be carried out in pressure-tested, sealed silos. Monitor stored grain monthly for moisture, temperature and pests. The combination of meticulous grain hygiene plus well-managed aeration cooling generally overcomes 85 per cent of storage pest problems. For grain storage, three key factors provide significant gains for both grain storage pest control and grain quality – hygiene, aeration cooling and correct fumigation. Use www.grdc.com.au/GRDC-FS-GrainStoragePestControl to ensure your link remains current and up-to-date! 302.48 kb Grain Storage Fact Sheet: Grain Storage Pest Control Guide (Western Region) The tolerance for live pests in grain sold off farm is nil. With growers increasing the amount of grain stored on farm, an integrated approach to pest control is crucial. 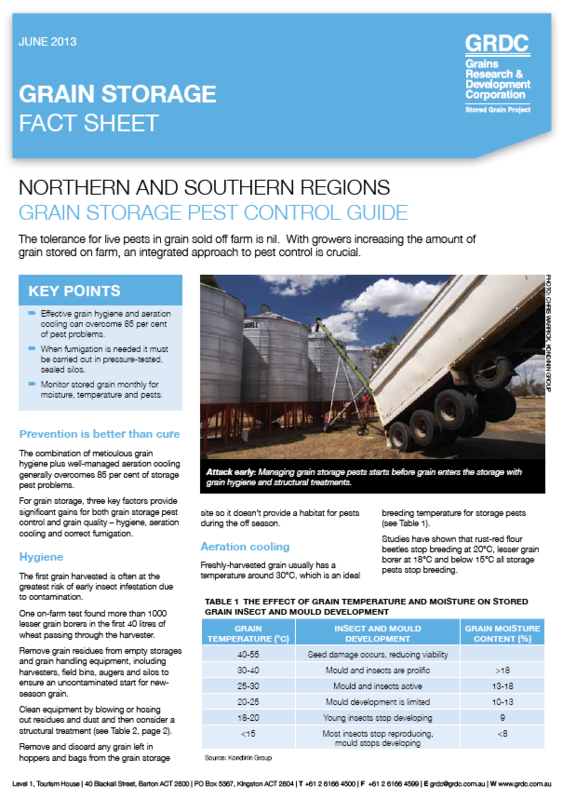 308.53 kb Grain Storage Fact Sheet: Grain Storage Pest Control Guide (Northern and Southern Regions) The tolerance for live pests in grain sold off farm is nil. With growers increasing the amount of grain stored on farm, an integrated approach to pest control is crucial.